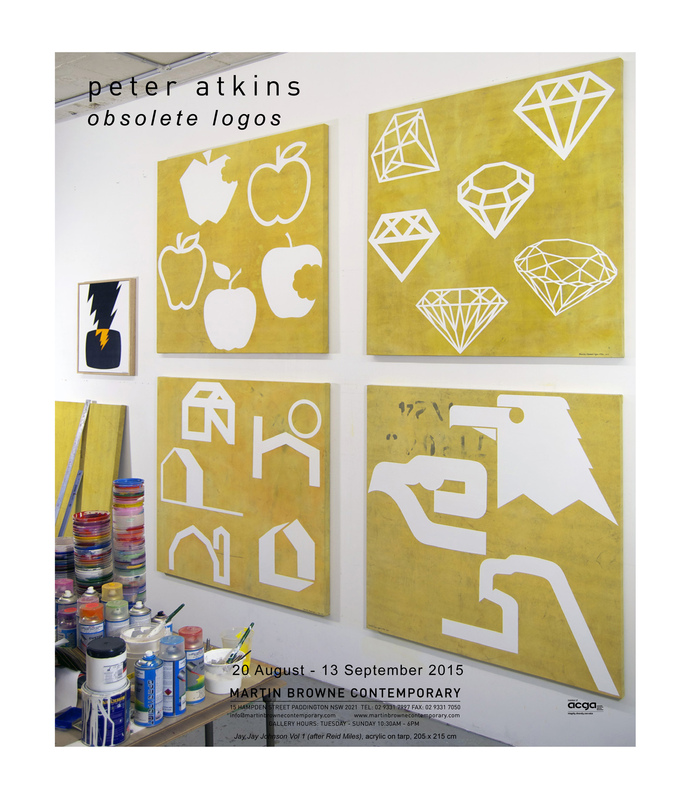 Obsolete Logos is an exciting new exhibition of paintings at Martin Browne Contemporary by one of Australia’s foremost contemporary artists, Peter Atkins. The exhibition brings together several strands of interest that have come to dominate his recent practice including the appropriation and re-interpretation of readymade abstract forms and the use of found, narrative laden materials. Described variously as a ‘visual anthropologist’, an 'insatiable voyager', a ‘hyper-caffeinated Bowerbird’ and a ‘visual terrorist’, this new exhibition sees the artist turn his meticulous attention to redundant, obsolete logos from the early 1970s. This exquisite new series of work sees the white painted logo forms appear to float over the faded yellow canvas tarpaulin providing an interesting juxtaposition between new and old, the forgotten and the remembered, it is this alchemy between material and process that interests the artist. Atkins has breathed new life into these old logo forms by obsessively collecting and categorizing them into various groupings - including hands, eagles, houses, sunbursts, diamonds and apples etc The artist was particularly drawn to these out-of-date logos because, as he explains, ‘I see these logos as emotional triggers…they have the capacity to evoke memory, nostalgia and a shared history of past experience…they are beautiful forgotten things, gentle reminders of who we were and where we have come from – they are signposts from the past leading us into the future’.